Hi everyone, here is my art journal page that I made earlier this week as it was raining and I was feeling down. It continued to rain all week but I am not down anymore. I made this page by spraying on several shades of Dylusions mists and water. I also splattered some diluted acrylic paints. 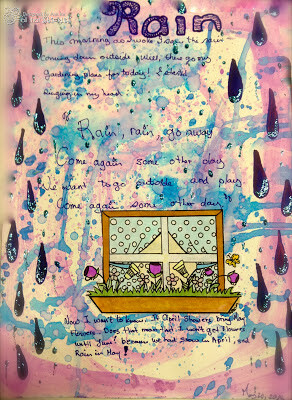 I wrote the poem about Rain and added a digital image from Bugaboo designs which I coloured with my copics and colouring pencils. I drew the large raindrops and decorated them with some Turquoise Stickles. As a Designer on the Team for The All That Stickles Blog I made this for the Linky party. Go and see what the other gals have done and join the party. Thanks for stopping by. Please leave a comment below and leave your email so you can follow me (box to the left).